Use the patterns in our applique design for your next woodland theme project. 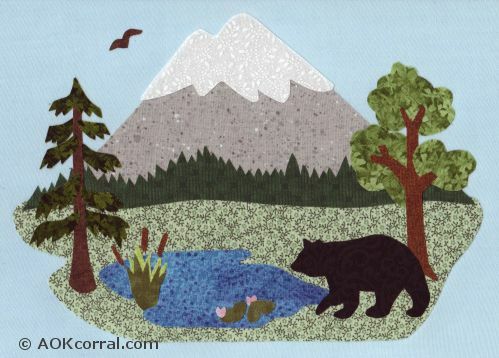 Our free applique patterns includes a mountain scene with forest trees, lake, and bear. The Easy Print Version contains ALL project instructions, patterns, and enlargement instructions for the woodland applique design. Decide which fabric colors you will use for each of the pieces. Cut out a square or rectangular piece of fabric that is large enough to fit the patterns you want for that fabric. Cut out a piece of fusible web just a bit smaller than the square of fabric. On your ironing board or a flat surface prepared for ironing, turn the fabric piece so that the wrong side is facing up. Follow the manufacturer's directions for applying the web to the fabric. Usually, that means placing the bumpy side of the paper against the wrong side of the fabric and going over it with a hot iron for 2 to 3 seconds. Lay the pattern pieces right side down on top of the paper. Trace around each pattern piece with a ball point pen. Prepare all the rest of the pieces for appliqué in the same way. Remove the paper backing from the appliqué pieces. Arrange the pieces onto your project as shown in the design layout placement photo with layers. Start with the first layer pieces. When each piece is correctly positioned, press a hot iron down onto the pieces and hold for 8-10 seconds. Pick up iron and place over more of the design. Do this over the whole design. Arrange the pieces for the next layer of the design and press with the iron again over all pieces on that layer. Finish with any other last pieces. This is a great design to decorate a quilt, cloth shower curtain, bedroom or kitchen linens and more for your log cabin theme or woodland theme. Easy to do Appliqué does not require a sewing machine.